To increase revenues and stay competitive, companies keep introducing new products and services. In the rapidly evolving age of technology, this helps companies stay relevant and secure their future. For new products to work for the company, they have to be effectively marketed and sold. 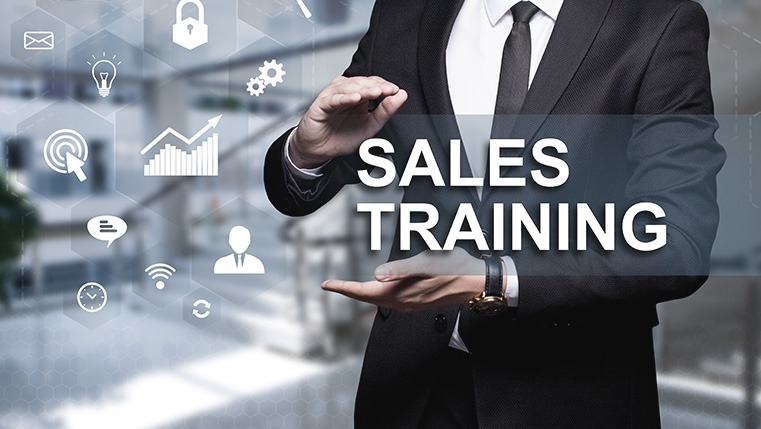 Sales training can be a major challenge for organizations, as it will directly reflect on the profitability of the company. ‘Sales’ is all about pitching to the clients, in the right way. A good sales training program should enhance a person’s interpersonal skills while providing them comprehensive knowledge of the products. It should also give them an insight of the current market situation and competition so that they can answer any query the client may come up with. Hence, sales training should be adaptive and cover a wide range of topics. However, people in sales are almost always on the road or busy with client meetings at odd timings. So gathering the entire sales team under one roof for training can become a huge logistical challenge. With high competition and tight sales targets, sales jobs are often high-pressured ones, leaving little time for employees to attend training sessions. E-learning programs are compatible with almost all kinds of devices and platforms. This means learners can access them anywhere and anytime. In an industry where work timings and schedules are erratic, this mode of learning blends well with the lives of employees as they can take trainings from almost anywhere. Companies can always keep a track of their progress, including assessment scores, using Learning Management Systems and set deadlines for employees, based on their sales targets. People who lack sales experience or are in need of more training can always opt to spend more time with the training modules, as per their convenience. Since interacting with clients is the biggest part of a sales job, it is essential that employees have excellent people skills. This makes it necessary for any sales program to include modules that focus on developing the communication skills of employees. E-learning programs often include interactive scenarios to clear many core concepts. These scenarios emulate real life situations that give employees a firsthand experience of their actual job. This allows employees to try and fail many times in the test environment, then succeed in the real one. It promotes decision-making and helps them differentiate opportunities from risks. Towering targets and high incentives make sales employees fiercely competitive. In case of classroom trainings, employees might get inconsistent knowledge transfer, based on the location and proficiency of the trainer. This might cause employees to be disgruntled and have a negative impact on the company’s harmony. E-learning avoids this situation by providing uniform, consistent training. The training can be made a user-centric one, using quizzes and assignments, helping organizations evaluate the caliber of employees on a personal level. A company might offer a plethora of services and products. Different services might not be completely different from each other, but only have specific altered portions, while the larger part remains the same. Using e-learning programs in such cases comes in handy for organizations. E-learning programs can have a high level of customization with a very high reusability of each section. Companies can have distinctive courses for all their services, avoiding confusion and increasing productivity. As we can see, e-learning programs go a long way in improving your sales training and delivering practical results, on the ground. Courses developed using proper design practices and visually appealing mediums can generate interest and increase the knowledge retention rate among employees. Your sales team brings in business and acts as the face of the company. Use the right e-learning program to keep them at the top of their game, and they will take your organization to the same place. Videos Empower Sales Reps with Comprehensive Knowledge – How?